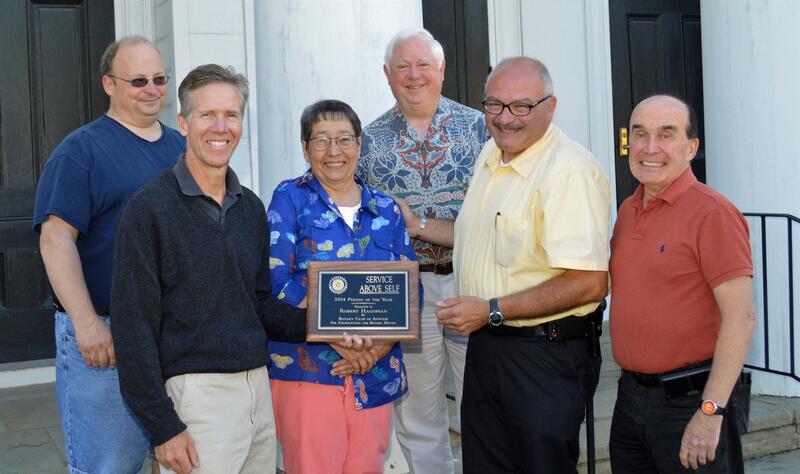 Each year, the Ipswich Rotary Club names a “Person of the Year” in each of the two towns which it serves, Ipswich and Rowley. This year’s recipient in Rowley is Rev. Bob Hagopian, pastor of the First Congregational Church of Rowley. Rotary recognizes outstanding local citizens who are not Rotarians for their “Service Above Self” outside their normal paid positions. Rev. Hagopian certainly represents the best of selfless service, frequently reaching out in the community beyond his parish to provide supportive spiritual or psychological care. For example, Rev. Bob has a deep and passionate commitment to 9/11, which he calls this generation’s Pearl Harbor. Each September 11th, Rev. Bob holds a candlelight ceremony at the church to recognize the deep link between the Town of Rowley and the 9/11 tragedy. Three of Rowley’s townspeople were among the passengers who died on American Airlines Flight 11, the first plane to hit Tower One. Rev. Bob understands the mental and spiritual damage done that terrible day, not only to the families but also to the community. Whether it is in times of joy, hope, sorrow or tragedy “The Reverend” has been there for all, usually behind the scenes offering his special gifts of faith, hope, and love, qualities that have endeared him to the entire town. In addition to being a tireless community servant, Bob is a great avoider of the limelight. As such, it was not easy for Rotary to corner this unpretentious hero. Rev. Hagopian had declined to be honored at our “Installation and Awards Dinner” last Spring, and again at a recent club meeting at the “Village Pancake House” in Rowley. So, to officially thank and recognize their humble honoree, the Rotary Club of Ipswich came to him, lying in wait at his church on September 4 until he returned from an early morning pastoral call. Reluctant to receive the award, Rev. Hagopian was more interested in singing the praises of the many people in his life, including his wife Anne, who he feels deserved such recognition more than him. 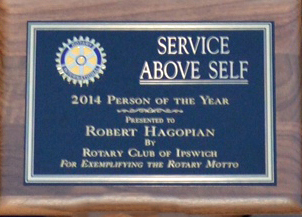 This is Robert Hagopian, self-effacing servant of the people, always putting others first, and Ipswich Rotary’s Person of the Year in Rowley. Rotarians on hand, from left: John Morris, President Brad Clark, Bob Gravino (rear), and Ray Katzen. Front and center are: Anne Hagopian, behind the plaque, and honoree Rev. Bob Hagopian. Taking the picture is Rotarian and Rowley Selectman, Bob Snow.